FILE - Tents stand on the other side of the shore of Laguna de Condado opposite the exclusive area of ​​Paseo Caribe in San Juan, Puerto Rico, Oct. 23, 2017. 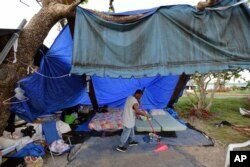 Much of Puerto Rico was still without power Wednesday, more than a month after the storm, but wealthier residents are sealed up in air-conditioned homes with their generators and bottled water, or have fled the island altogether for extended vacations, while the poorest are left swatting mosquitoes in sweltering heat and trying to secure enough water. 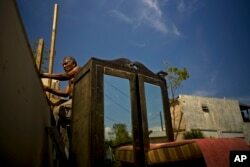 FILE - Efrain Diaz Figueroa attempts to repair the roof of his sister's home destroyed by Hurricane Maria in San Juan, Puerto Rico, Oct. 9, 2017. The Category 4 storm was among the most devastating the U.S. territory has ever seen, killing more than 50 people. It ripped up giant trees, wiped out power to the entire island, demolished scores of homes and badly damaged thousands more. About 70 percent of people now have water, but still must boil it or treat it to make it safe to drink. Governor Ricardo Rossello has pledged to get 95 percent of power back by Dec. 31; right now, about 30 percent have electricity. FILE - A resident sweeps at a camp set up on the shore of Laguna de Condado in San Juan, Puerto Rico, Oct. 23, 2017. "We're doing OK, all things considered," said Jesus Gonzalez, 43. Like many, the generator in his building runs during the evening, the cost of which is split among the tenants. They have access to laundry machines, so he doesn't mind sweating at the gym. When the generators broke at the home of Dr. Linette Perez in the upscale suburb of Guaynabo, she and her husband and son went to a luxury hotel for three days to get some relief. Her home suffered minor damage; her beach house was worse. The family is thinking of leaving for the states, like tens of thousands of others already have. "The generator exploded because we used it so much," she said as her 7-year-old, Gustavo, swam in a clear, cold pool. "We couldn't get another right away big enough for the house so we came to relax." But life is increasingly desperate for others, especially outside of the city where it's been more difficult for aid workers to reach families cut off by fallen bridges and mudslides. Hours are longer because they are washing clothes by hand, hunting for food and water, and spending any free time cleaning up the wreckage of their homes. 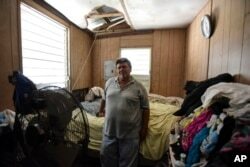 FILE - Moises Valentin poses for a photo in his home damaged by Hurricane Maria, where the U.S. Army Corps of Engineers built him a temporary roof, in San Juan, Puerto Rico, Oct. 19, 2017.